The 2018 statewide winners were announced in May. See the winning posters on Flickr. The Georgia Department of Natural Resources (DNR), The State Botanical Garden of Georgia and The Environmental Resources Network, Inc. (TERN) encourage you and your students to participate in the 29th annual Give Wildlife a Chance Poster Contest! As part of DNR and TERN’s “Kids For Conservation” initiative, this art contest provides a unique opportunity for kindergarten through fifth-grade students to explore the wonders of Georgia’s native plants and animals through the 2018–19 theme: Pollinator Power! Native species are those that naturally occur in Georgia, unlike exotic species that were introduced from other places and may be invasive (like kudzu). Georgia’s native plants and animals come in all shapes and sizes—from the large, moss-covered live oak (our state tree) to the little grass frog, the smallest frog species in North America. Our state is home to approximately 3,600 species of native plants, about 950 vertebrate species and countless invertebrate species and non-vascular plants. About 95% of Georgia’s native wildlife species are nongame (those which are not legally fished for or hunted) and include rare, threatened or endangered animals and plants such as Barbour’s map turtle and dwarf trillium. From remote forests and fields to neighborhoods and cities, wildlife can be found everywhere. Take your students outside to discover Georgia’s wildlife! Schoolyards and backyards are great places to start, but you can also explore community green spaces, botanical gardens, nature centers, state parks, and wildlife management areas. We look forward to working with you and your students at the 29th annual Give Wildlife a Chance Poster Contest! If you have any questions, please contact: Linda May (linda.may@dnr.ga.gov, 706-557-3226) or Cora Keber (ckeber@uga.edu, 706-542-6158). The Georgia Department of Natural Resources (DNR), The State Botanical Garden of Georgia and The Environmental Resources Network, Inc. (TERN) invite you to participate in the 29th annual Give Wildlife a Chance Poster Contest! Wild animals and native plants enrich our lives and serve special roles in the environment. We may easily notice and marvel at the bigger creatures we see, but what about the insects and other pollinators that help our plants to bloom and produce fruit and seeds? We challenge you to discover the importance of these smaller species through the 2018–19 Give Wildlife a Chance Poster Contest theme: Pollinator Power! We can thank pollinators for producing much of the food we eat. In addition to agricultural crops and other food products, pollinators help to create the fruits and seeds that many wild animals need to eat—and sometimes the pollinators serve as food themselves! For example, some songbirds primarily eat seeds or fruit while others go after insects. Larger animals like black bears, raccoons, opossums and gray foxes eat fruits from native plants like blueberries, blackberries, elderberries, mulberries, persimmons, wild plums and muscadine grapes. While certain bats in the other parts of the world eat nectar and therefore serve as pollinators, Georgia’s bats only eat insects (including pesky mosquitoes!). Despite their importance, pollinator populations are declining. Habitat loss and pesticide use are their main threats. Much of Georgia’s native vegetation has been replaced by roads, buildings, parking lots, and neighborhoods with manicured lawns. Weed killers and insecticides can quickly wipe out bees, wasps, butterflies and other beneficial insects. Pollinator diseases, parasites and invasive species cause damage too. By reducing pesticide use and creating pollinator habitat, even in small patches, you and your students can help to reverse this trend! The goal of the Give Wildlife a Chance Poster Contest is to generate a greater knowledge and appreciation of Georgia’s diverse and increasingly threatened wildlife and their habitats. It is only a deep concern and commitment to these wild places that will ensure their existence for future generations to enjoy. While following the Poster Contest Rules and Guidelines, your students will design their own artwork based on this year’s contest theme. Then they will compete at the local level in a school-wide poster contest (homeschoolers may participate within their homeschool group). First-, second- and third-place winners should be chosen from your school’s entries for the local-level contest (award ribbons and Give Wildlife a Chance certificates are available—refer to Contest Awards section for details). Participating schools will then choose one first-place winner from each division and mail the winning entries to The State Botanical Garden of Georgia to compete in the state-level contest by the April 12, 2019 deadline. These entries will be comprised of the four division categories described in the Poster Contest Rules and Guidelines section. 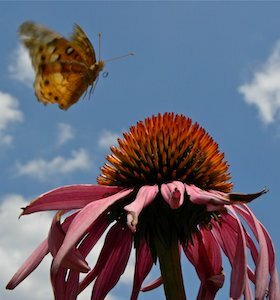 First-, second- and third-place winners will be chosen as state-level winners from each division level, and their artwork will be showcased on GA DNR Wildlife Resources social media, as well as at the State Botanical Garden in Athens from May 9–14, 2019. Learn all about butterflies! You can find information about their life cycle, species identification and the plants they need (host and nectar) through GA DNR, Monarchs Across Georgia and butterfly field guides (ie., “Butterflies and Moths” Golden Guide, “Butterflies Through Binoculars: The East,”etc). Create habitat for pollinators! Leave a portion of your property unmowed or plant a garden with pollinator-friendly plants (preferably native!). Even a small garden will help to reduce habitat fragmentation. Learn more through the State Botanical Garden’s Connect to Protect program. Provide nesting sites for bees by leaving sunny patches of bare soil, ditches and woodland edges undisturbed (for soil-nesting bees) and by constructing bee homes for your garden. Monitor hummingbird and monarch butterfly migration through Journey North. Make plans to participate in the 2019 Great Georgia Pollinator Census. The 29th annual Give Wildlife a Chance Poster Contest is sponsored by The Georgia Department of Natural Resources, The State Botanical Garden of Georgia and The Environmental Resources Network, Inc. (TERN). The theme changes yearly, though the contest is an ongoing educational effort to help children and teachers gain awareness of Georgia’s native plants and animals. Artists as well as wildlife and plant professionals judge the contest entries based on artistic interpretation, originality, visual impact and contest theme. The contest is open to individual students (no group drawings) in kindergarten through 5th grades. Homeschool groups, public schools and private schools are encouraged to participate. Each school/group may enter no more than at total of four posters to the state level contest (one per division). Outside dimensions cannot exceed 17" x 22" (vertically or horizontally). Collages and other three-dimensional artwork are not suitable for this contest. Posters should be submitted on white tagboard or on white art paper (no matting). DO NOT FOLD. Submit art flat in a package or roll into a mailing tube. If you want the students’ entries returned, you MUST include exact postage (stamps only—no metered tapes) and mailing label or the entries will not be returned. While following the Poster Contest Rules and Guidelines, instruct your students to create their own artwork based on this year’s theme, and arrange for a local competition of their artwork at your school or within your home school group. Each entry should depict at least one identifiable native plant and/or animal of Georgia. Please include the artwork description information on the Poster Contest Entry Form, thereby demonstrating to the judges that the student researched their subject. First-, second- and third-place winners should be chosen at the local level (refer to Contest Awards section). All participating students can receive place award ribbons and a Give Wildlife a Chance certificate (refer to Contest Awards section). Only ONE school-wide winner from each division can be chosen to compete in the state-level contest at The State Botanical Garden of Georgia (refer to Eligibility section). State-level entries are normally the artwork of the first-place school winners. All contest entries must adhere to the contest theme: Pollinator Power! Attach a copy of the poster contest entry form to the back of each poster with tape. Please DO NOT use glue or staples. ENTRY DEADLINE: Friday, April 12, 2019. Certificates & Ribbons: Educators may request Give Wildlife a Chance certificates for all students who participate in their local school competition, as well as first-, second-, and third-place ribbons to present to class, grade level or school group participants. There is no limit to the number of certificates or ribbons a participating school can receive. State-level Award: The artwork that is selected as first-, second- and third-place winners at the state level will be showcased on GA DNR Wildlife Resources social media as well as displayed at the State Botanical Garden in Athens, GA from May 9–14, 2019. Students also will receive state-level ribbons and may be recognized in other ways. Teachers and parents are encouraged to bring children to see the winning artwork on display and enjoy the beauty of the garden’s fascinating variety of plants. The fields and forests are great areas for wildlife watching too. Admission is free, although donations are accepted. For directions, operating hours and a garden map, visit http://botgarden.uga.edu. Special Perks for Teachers & Parents of State Winners! The teacher and one parent of each state-level winner will receive a free bald eagle wildlife license plate, thanks to TERN: the DNR Wildlife Conservation Friends Group! The "Exploring Georgia's Wildlife" coloring book is a great teaching aid that covers native animals and plants, ecoregions, habitat requirements and more!